As I told you last week, my friend Terri and I were going to a canning class. I had some experience with steam canning spaghetti sauce from my garden vegetables, but I wanted to know more. I can't tell you how excited Terri and I were, and we probably embarrassed ourselves by repeating it exuberantly and often during the class. Along with seven other enthusiastic ladies, our small group were the recipients of time-honored knowledge on canning and preserving. Our class was led by a woman and her two daughters, and daughter-in-law. They live in a homestead community and canning is a way of life for them. They have the good fortune of gathering produce from the bountiful harvest of their community gardens, and they can it every day. I was jealous! And I was thrilled to learn that we would get a taste of canning several different types of food, and today, I'm going to share with you the one that I was most interested in learning about. My husband made me promise that I would ask them about canning meat, since a grid-down scenario would render our refrigerators and freezers full of meat useless. So guess what the first thing we canned was? Steak! I was so thrilled and couldn't wait to tell him that it was not as mysterious or difficult as I had imagined. We started with a nice, hunk of red meat -- chuck steak is what we canned, but any piece of meat will do (more about that later). 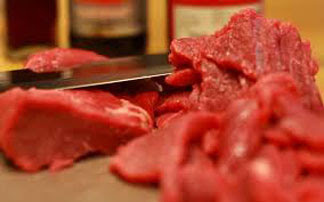 We simply cut the excess fat off the edges and cut the meat into approximately 1 inch x 1 inch cubes. Then we spread out the meat on our cutting board, and added salt and pepper. That's all! You can add other herbs and spices if you desire, but I figured the simpler, the better. I can flavor the meat when I cook my recipes in the future. Then we packed the meat into our pint jars, as tightly as we could, leaving about an inch of space at the top. Then the lid was added and screwed down with the ring. 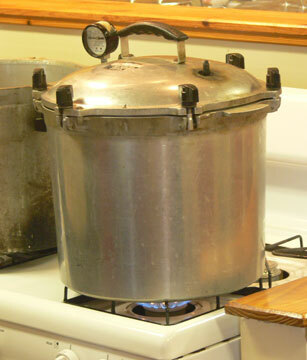 Our jars were positioned in the canner and cooked at 10 pounds of pressure for 90 minutes. And the result were beautiful jars of cooked beef, afloat in their own juices. The cooking process produced the liquid in the jar, without adding any extra. I was amazed that it was that simple! The following pictures give you an idea of just how uncomplicated and effortless it was. 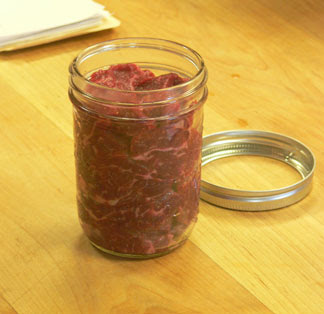 After seasoning, pack meat into jar as tightly as possible. Now for the REALLY interesting pieces of information. We were told that you could take any tough piece of meat, and by canning it, you will get a piece of meat so tender, it will fall apart on your fork! Our instructors said you could take the toughest old rooster and can it, and you would think you were eating gourmet food. 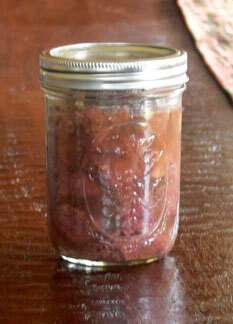 Also, canning venison eliminates the game-y taste. Plus you can quarter a chicken, and a quart jar will hold the breasts and legs/thighs. Just think - a tender, juicy chicken in a jar! So my plan is to take the less choice meats in my freezer, thaw them and can them. Otherwise, I know they would stay in the bottom of my freezer until they were burned, and would then be thrown away. And I cannot stand the thought of wasting food when I know what we are facing! Needless to say, I invested in an All-American canner, which is the only brand I would consider. I really couldn't afford it, but after realizing that I could provide organic, healthy, and superior food --- and know EXACTLY what was in the jar --- it just seemed a no-brainer. No more wondering what additives have been thrown into the mix, or where the food came from. But the best thing about learning this skill is that I can just imagine my grandmothers smiling down from heaven! Psalm 63:5 "I will be fully satisfied as with the richest of foods; with singing lips my mouth will praise you." What is the shelf life of the canned food? Our instructors said easily one year, but they eat year round from their harvest. In other words, I think they can their produce to store food throughout the year until the next harvest. I've read online where people have eaten canned foods years after they processed it. I cannot recommend that. To be safe, I plan on canning and labeling my jars and eating it within the year, or close after; replenishing my store throughout the year so I always have plenty on hand. Canning will not be a one-time event for me.